Sumatriptan tablets are a medication used to treat migraine headaches. Order sumatriptan tablets online - our service is fast, safe and convenient. To place your order, fill in our brief medical questionnaire. One of our online doctors will review your order and approve appropriate treatment. Sumatriptan tablets are used to treat migraine headaches, commonly known as migraines. Migraine symptoms may include: a throbbing headache on one side of the head, disturbed vision, vomiting or nausea, and a sensitivity to sound or light. Experiences of migraine will vary from person to person but can be very painful and uncomfortable for the sufferer. We still do not know exactly what causes a migraine, but many people report certain physiological or dietary factors as triggers. Tiredness, stress and hunger are all thought to play a role in some people, as are certain foods and drinks such as those containing caffeine, dark chocolate, cheese and red wine. Sumatriptan works by reducing the temporary widening of blood vessels in the head that cause a migraine headache. This in turn relieves the symptoms of the headache. Sumatriptan tablets will only work once the migraine attack has started and you are experiencing symptoms of a migraine headache. It cannot be used to prevent an attack. Sumatriptan tablets should be swallowed whole, with water. You can take them with or without a meal, but do not chew or crush your tablets. Sumatriptan tablets should be taken as soon as possible once your migraine attack has started. It will only work during the attack itself and cannot be used beforehand in order to prevent one. Each Sumatriptan tablet contains one single dose of migraine relief medicine. You should always follow the instructions for dosage given to you by your prescribing pharmacist, nurse or doctor. Please note, product packaging may differ from the image above. Children under the age of 18 and adults over the age of 65 should not use Sumatriptan. If you have a liver problem, you may be prescribed the 50mg tablets. Only take one dose of Sumatriptan per migraine attack. You should not take a second dose for the same attack, even if the symptoms of your migraine attack are not reduced after taking the medication. You need to wait until a subsequent migraine attack to take another dose of Sumatriptan. Never exceed 300mg of Sumatriptan in one 24 hour period. If you accidentally take more than the recommended dosage of Sumatriptan, seek immediate medical attention. What if I forget to take or miss a pill? If you forget to take your Sumatriptan tablet, are sick (vomiting) or have diarrhoea immediately after taking one, do not double your dose to make up for it. Wait until your next migraine attack before taking another tablet. 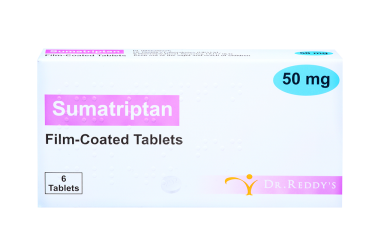 The active ingredient in Sumatriptan tablets is sumatriptan at a strength of either 50mg or 100mg. Other ingredients in your Sumatriptan tablets are: polysorbate 80 (E433), croscarmellose sodium (E468), microcrystalline cellulose (E460), calcium hydrogen phosphate anhydrous (E450), magnesium stearate (E470b) and sodium hydrogen carbonate. Seek medical attention if any of these common side effects become severe or are long-lasting. You should always discuss your previous medical history and tell your doctor about any medicines you are currently taking before starting treatment with Sumatriptan. Some medicines may alter the effectiveness of Sumatriptan if taken alongside, and vice versa. You must not drive or operate any heavy machinery if you experience faintness, drowsiness or tiredness as a result of taking Sumatriptan. In some cases, taking Sumatriptan too often can make your headaches worse. Discuss things with your doctor if this applies to you as you may be advised to stop using Sumatriptan. Tension headaches - What are they and what causes them? Why do cluster headaches happen?